From 75 to 110 € the night I book ! 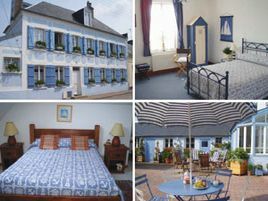 This large, traditional house, completely renovated, is situated in the centre of Crotoy, on the Somme Bay, very close to the beaches and the port. Very comfortable rooms with maritime decor. Breakfast is served on the veranda with its tropical plants or in the lovely flower-decked courtyard. A friendly franco-brazilian welcome from Rosana..
3 rooms with shower and WC. 78 euros (1 pers. ), 90 euros (2 pers.). The closest station is Noyelles-sur-Mer, located at 7 km.